Obeying God by stepping into a ministry calling can be extremely difficult if the training required to do so leaves a student buried in financial debt. As a result, our commitment is to offer a quality, accredited Biblical education in a format that brings the best of many layers together; tuition that will allow students to invest in Biblical training in a manner consistent with the Biblical admonition that “servants (instructors/professors) are worthy of their hire”, while at the same time not leaving students under an oppressive burden of debt. Simply put, we strive to provide the life-giving sweet spot between the most affordable, highest quality, Biblical and Ministry education that we can offer as a ministry to the Lord and His people. Course tuition fees for undergraduate courses are $175 per course ($58.33 per credit-hour) and includes the primary textbook costs. Each yearly program covers nine (9) courses plus Ministry Practicum which runs concurrently throughout the 10-month academic year. 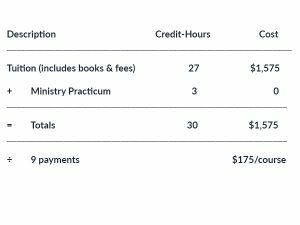 The completed courses plus Ministry Practicum credits provide a student with 30 credit hours per academic year. We have an extremely flexible financial format to make access to Theos Bible College as life-giving as possible. For example, a student may choose to pay the whole year’s tuition up front or that student may choose to access the equivalent of a Student Loan in the form of a “pay-as-you-go”* program paying for each course before the course begins. TBC will not produce official transcripts nor allow students to participate in a commencement exercise until all outstanding fees have been paid. All fees are non-refundable. The $50 Application Fee covers the time spent processing/verifying the application and assessing a student’s academic standing and qualification. Students who participate in TBC Commencement Exercises are required to purchase their own cap and gown through TBC. This fee is based on outside vendors and varies from year to year. The fee must be paid before TBC orders all the students’ caps and gowns. Students will have a 90-day advance notice before the deadline in order for everyone to have time to provide size preferences and payment. If the student’s account is paid in full, a student may submit a TBC Transcript Request Form (found in Appendix A under Student Forms) to the Office of the Registrar. Each graduating student will be provided one official transcript free of charge upon request. Additional transcripts will be provided at a cost of $10 each.